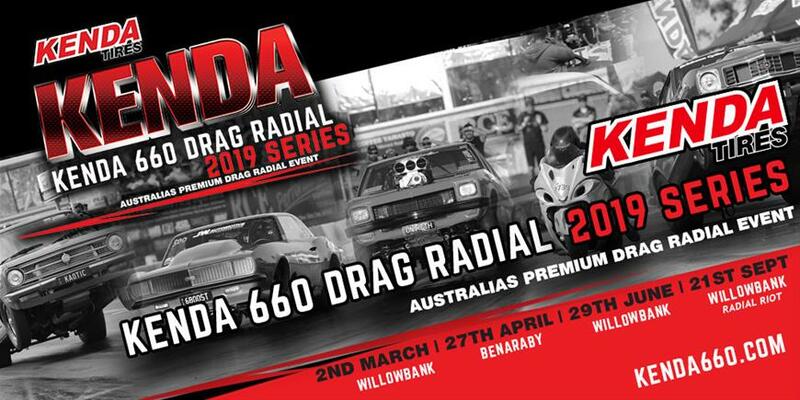 2019 will see the Kenda Tires 660 Drag Radial Series roll on to its 5th straight year at Willowbank Raceway. The newly formed partnership for 2019 with Willowbank Raceway will see all 3 rounds contested as standalone Drag Radial Only Events!!! This will allow for more growth in the Australian Drag Radial Scene to which the Kenda Tires 660 Drag Radial Series has stepped up and put the following wild & exciting Drag Radial Classes together for 2019!!!! In the event of an incompleted round of racing for any reason no points will be allocated for that round. After the final round, if there is a tie in points the competitor that performs the best in the last round of racing will be the champion for that bracket. Entry - Pre-entries only and will be available on the website until midnight the Sunday prior to each round. Any entries received after the cut off may not be accepted, if accepted a $250 fee will be charged. Entries will not be accepted on the day. All Entrants must abide by the Willowbank Raceway and IHRA Australia rules and regulations. All vehicles running quicker than 6.37 must hold a current permanent IHRA Drag Racing Licence and a current IHRA Log Book. Round 1 Saturday 2nd March 2019 - $175 which includes driver and 3 crew. Round 2 Saturday 29th June 2019 - $175 which includes driver and 3 crew. Radial Riot Saturday 21st September 2019 - $200 which includes driver and 3 crew. CAS/ Audit - CAS and audit will be completed at the Scrutineering Shed. Maximum Half Chassis Vehicles . No 3/4 Chassis or Pro Mod Cars Allowed. Must run on a maximum of a 275/60R15 Radial Tyre. Maximum Half Chassis Vehicles. No 3/4 Chassis or Pro Mod Cars Allowed . Must run on a maximum of a 235/60R15 or 26x8.5R15 Radial Tyre. Anything goes on a radial, will require current IHRA tech and licensing. Anything goes on a radial aimed at the Street Car Racers. No IHRA Tech or IHRA License required, race on a IHRA Day License purchased on the day at each event. * All Classes are Heads Up, Pro Tree, 1/8th Mile, Kenda 660 Chicago Shootout. 3 Qualifying Passes, 3 Rounds of Racing plus Class Finals. * Finalist are chosen from the two most winning cars/bikes. If more then two cars/bikes with equal wins it will come back to the fastest two cars/bikes from round 3 of racing. * All racers are required to have the correct license and tech as per IHRA requirements prior to race day, excluding day license racers. License Performance Passes can be arranged for test days prior to each event with IHRA Australia at the racers expense. *No Class changes can be made once your 1st qualifying pass is made at each event. Southside Safety Certificates After Party - No need to pack and level. Stay on for the Southside Safety Certificates After Party where you can kick back and enjoy a snag and cold drink with all the racers while we hand out all the great prizes, you never know it could be you walking away with a prize!!! Racers in both Radial Renegade & Radial Rumble will have the chance to collect $500 cash for the most round wins over the three events run at Willowbank Raceway in each of these two classes this will be awarded during presentations @ Kenda Tires Radial Riot!!!! It our way of saying thanks to racers that support us!!!! (Racers will be required to retain all their racing time cards to show as proof to collect the $500 in their allocated class. Racers are to notify Kenda 660 Offical’s at Radial Riot if they think they are in the running). Toptyres Australia- Willowbank Raceway - On Point Media - Drag Photos - Powercruise - Horsepower Solutions - Speed City - Dream Team Motorsports Consulting - Total Venue Concepts, All Type Engineering, FirePro. We hope to see you on track in 2019 at the KENDA Tires 660 Drag Radial Series! !